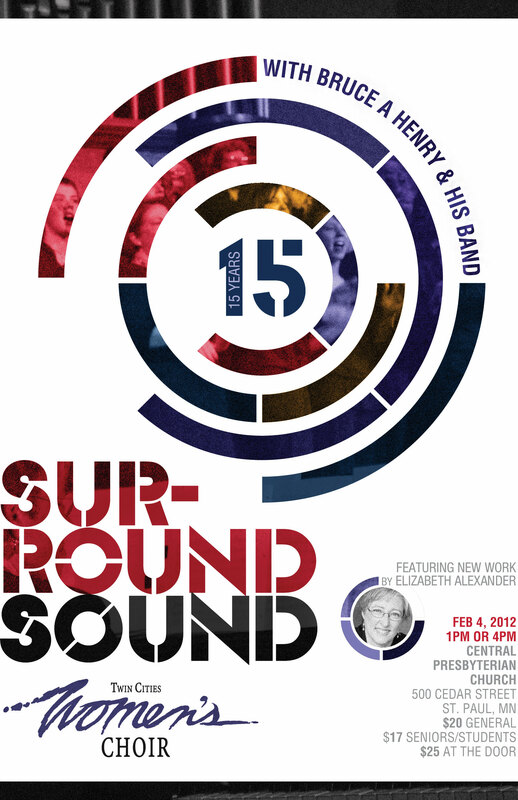 Mix Creative designed a concert poster for the upcoming Twin Cities Women’s Choir’s 15th Anniversary concert, Surround Sound. The concert will celebrate the choir’s 150 women’s voice and the richess of stories and sound established over the choir’s 15 years. The concert will blend with the gospel/jazz of the Bruce A Henry band. In creating the design, Mix Creative’s creative director, Katrina Hase, conceptualized sound as waves, emanating from a central source: the choir’s 15 years. “Sound wave” design elements lead the eye toward the concert name, which is intentionally broken after the SUR- to emphasize the relationship between “round” and “sound”, thus implying a fullness of the auditory experience. Superimposing these graphic elements over a duo-toned image of the choir, the design captures a sense of the excitement of viewing the choir. 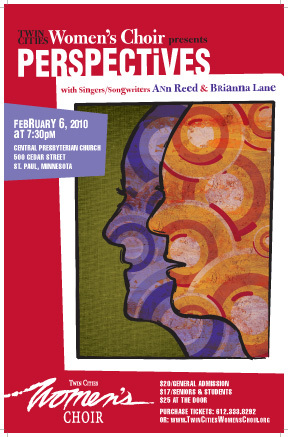 Mix Creative created this poster design to promote the upcoming Twin Cities Women’s Choir concert, Perspectives. The concert, which feature singers/songwriters Ann Reed and Brianna Reed will premier a composition for the 140-voice choir that is the compilation of the two performers’ unique perspectives. In designing this poster, we used profiles of the singers/songwriters overlaid with dynamic, colorful, contrasting circles to represent their unique musical perspectives. The circles also symbolize many parts combining to form a musical whole, as with the women’s voices in the choir. A rich sense of texture mimics the corresponding depth of the musicians’ compositions. The poster maintains a sense of informality with its typography, conveying to the viewer that Perspectives is a dynamic, celebratory concert. For more about Perspectives and the Twin Cities Women’s Choir 2009-2010 Season (including tickets), visit their site: www.TwinCitiesWomensChoir.org.